Russian Prime Minister Vladimir Putin announced a deal between British oil major BP and Russia's Rosneft to explore the Arctic shelf. Russia's oil major Rosneft and British oil giant British Petroleum agreed on joint shelf projects in Russia and other states, Russian Prime Minister Vladimir Putin said on Friday. "I know that your company and one of Russia's top oil firms, Rosneft, have reached serious agreements on joint shelf projects in Russia and third countries," Putin told BP management. BP said it would swap five percent of its shares, worth $7.8 billion, for 9.5 percent of Russia's state-controlled Rosneft as part of the deal. "I don't see anything here that's negative. It's not going to move the needle from a substantive standpoint any time soon, because a strategic alliance to drill in the Arctic is not something that's going to materialize immediately," said Pavel Molchanov, an analyst with Raymond James in Houston, Reuters reported. There will be seismic surveys, technical assessments, environmental studies. In several years, it's not even clear when, close to 2015 before the companies will begin to drill in the Arctic in a meaningful way. This is not something that's going to bulk up BP's reserves immediately. Hopefully this will be a good growth driver over time." "The resources of oil in question stand at 5 billion tons, and those of gas, at 10 trillion cubic meters," said Putin. "These are serious figures that need further confirmation, but they are quite realistic and I hope that these estimated resources will become proven reserves." The project will require an investment of tens of billions of dollars and advanced technologies, Putin said. "The Russian government intends to create most favorable tax and administrative regime to develop the project." Currently, Rosneft and BP jointly develop the Sakhalin shelf in Russia's Far East. In 2006, the companies signed a memorandum to develop the Arctic shelf. However, thus far they have not developed any projects there. Russia, the United States, Canada, Denmark and Norway are seeking to assert jurisdiction over parts of the Arctic, which is believed to contain rich oil and gas deposits. The vast hydrocarbon deposits will become more accessible as rising global temperatures lead to a reduction in sea ice. Easier access to untapped natural resources of the Arctic will inevitably lead to the construction of dozens of new pipelines and require well-coordinated monitoring of oil and gas exploration in the region. Russian experts estimate recoverable oil and gas resources on the continental shelf at 100 billion tons of reference fuel. Putin also congratulated Rosneft and the BP upon growth in the prices of their shares. "BP and Rosneft have started to grow," he said. "I wish to congratulate you." About the oil spills in the Gulf of Mexico last year, Putin said: "There is a good saying - wit once bought is worth twice taught." "Our experts have scrutinized the tragedy, we know that BP was the organizer of the project, but there were also eight sub-contractors, including major U.S. companies," Putin said. "This indicates that together, we must carefully analyze everything that happens from the beginning regarding offshore projects," Putin said. Rosneft is the leader of the Russian oil industry and one of the largest public oil and gas companies worldwide. The principal activities of Rosneft are exploration and production of oil and gas, production of petroleum products and petrochemicals, and marketing of these products. The company is on the list of strategic enterprises in Russia. Its major shareholder (75.16 percent of shares) is the company Rosneftegaz, which is 100 percent state-owned. Rosneft has 22.9 billion barrels of proven reserves, which is one of the best indicators among the public oil and gas companies worldwide. 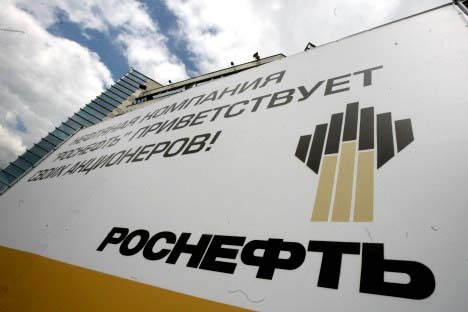 By its reserves of liquid hydrocarbons Rosneft is the undisputed leader. Its current proven reserves are big enough to last 26 years, and most of its fields are classified as traditional, which makes it possible to effectively increase production. The British Petroleum corporation is one of the largest oil companies in the world. Currently it is present in more than 100 countries, and its staff numbers more than 80,000. It is headquartered in London. BP owns refineries and petrochemical enterprises and a network filling stations, and it produces oil and lubricants. It owns shares in ten pipelines and five regasification terminals in the North Sea, in a pipeline in Alaska, as well as in several terminals for liquefied natural gas in the Gulf of Mexico. Currently, BP produces about 4 million barrels of oil per day, which is about 5 percent of total global daily production. In Russia, BP is a co-owner of the oil company TNK-BP on a par with Russia's Alfa-Access-Renova. TNK-BP, formed in 2003, is one of the leading oil companies in Russia and among the ten largest private oil companies in the world in terms of crude oil production. TNK-BP produces 60-70 million tonnes of oil annually, accounting for 23 percent of the total production of British Petroleum. "